On Saturday, March 16th, 4 LEG members took advantage of the nice weather for a trip into Mystery Cave. Genie Schropp, Teresa Boerma, Kelly and Matt Bliss entered the Cave around 11:00 am. After spending close to 5 hours admiring the beautiful speleothems and borehole passage, they exited cave around 4:00 pm. Pleasantly surprised to see the sun still shining, they finished the day off with food and drinks at Jackson Street BrewCo in Perryville. Here are several photos from a couple different Union County projects currently underway. 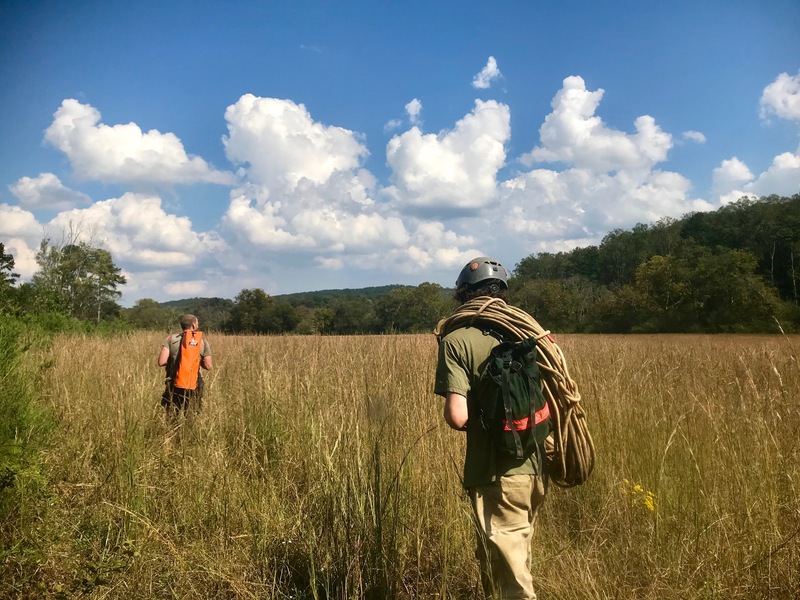 LEG member Matt Bliss has been actively surveying several private caves in Union County. Here are a few photos and a YouTube link to video, from Matt Bliss’s trip to the TAG Fall Cave-in. 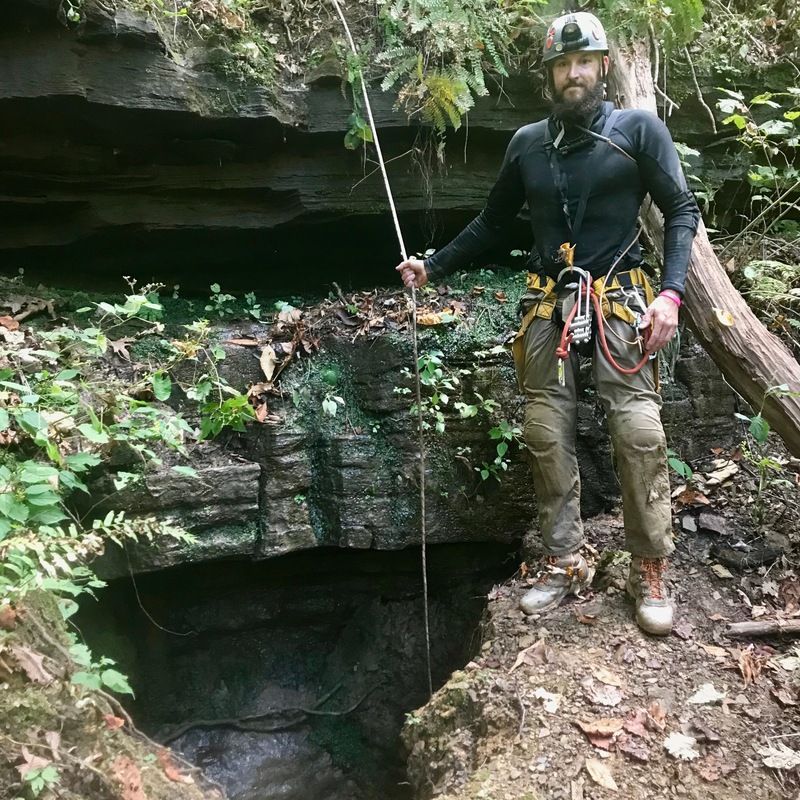 He and several other local cavers spent Thursday-Sunday in Tennessee, Alabama and Georgia exploring several vertical caves. Sinking Cove Cave- 5 drop pull-down trip. Cemetery Pit- 125’+. Richard’s Cave- wet, multi drop cave ending in the largest room in GA. Flowing Stone Cave- 225’+ pit. 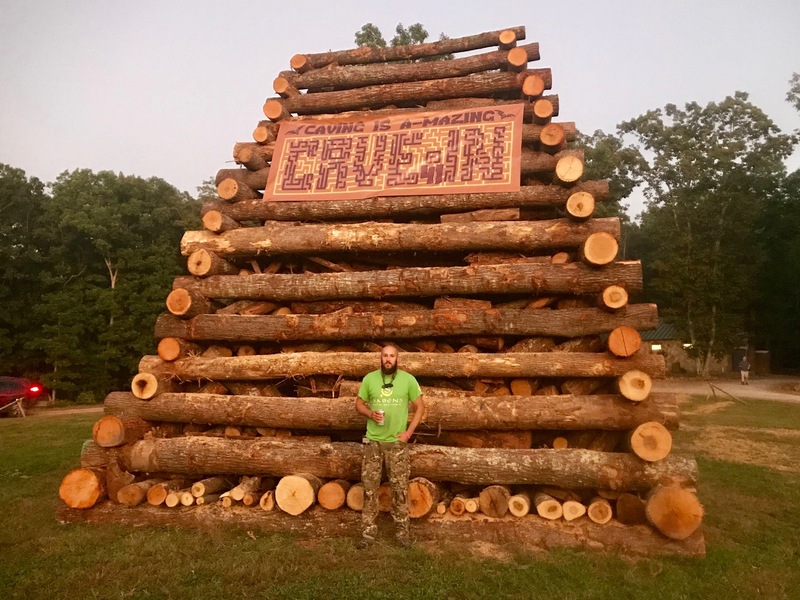 Bonfire, beers, hot tub, food and vendor tents where enjoyed by the group. The purpose of the trip was to introduce our new member Matt Bliss to the wonders of Mystery, re-visit some of the upper passages, and, of course, get out and get deep underground! Genie and Mihai arrived at Park-et at about 9:40 AM and met with Richard and Matt. After breakfast they left for the cave, which they entered at about 11:00 AM. At that time it was not raining outside. There was more water entering the cave through the historic entrance than usual and the stream was muddy. 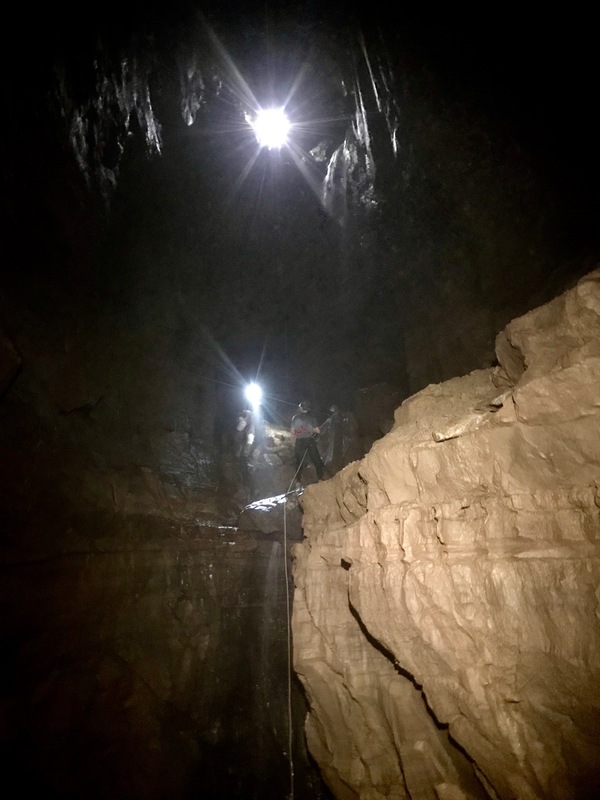 Once inside via the gated entrance, the cavers went down to the main stream and decided it was too hazardous to continue downstream toward the Frozen Niagara passage. The water was just too high. The upper sections were deemed safe so it was decided to visit the Red Fork, Fossil, and Liberty Bell passages after, of course, paying a visit to the Monkey Paw speleothem and the nearby rimstone pools. Grateful thanks were said to all previous cavers who left the nice footholds in the clay slopes. The volume of water flowing through the upper passages was not much higher than usual despite the previous days’ rain. The Red Fork and Liberty Bell passages were followed until they became tight and the Fossil passage to the blocking collapse deposits. 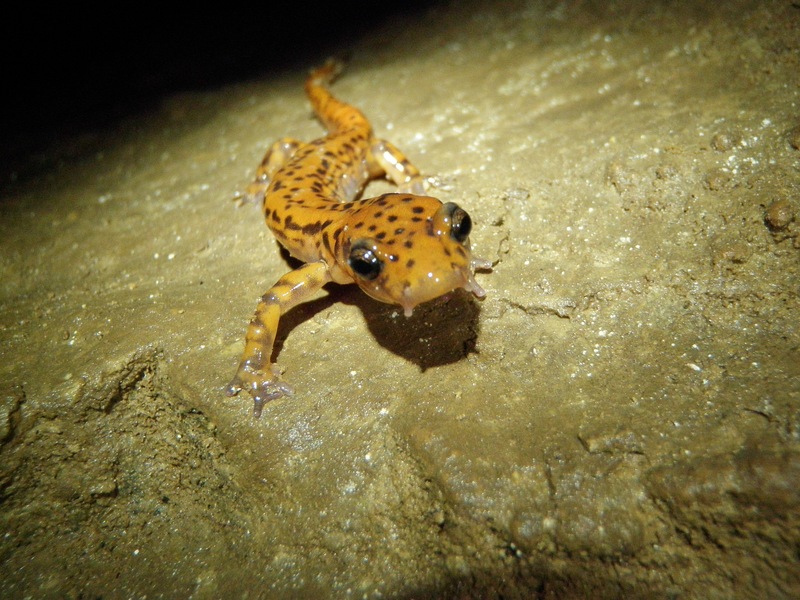 The youngest sparkly white speleothems were much admired and a pigmented orange salamander was encountered. And many jokes were made inside! It was raining lightly when the team exited the cave at 4:00 PM and a puddle had formed at the bottom of the entrance pit. It took the combined efforts of Richard and Mihai to close the gate lock; a new one is needed. The cavers left the cave area and had dinner at Park-et where they relished the womderful experience of being underground. As usual, the Carbondale cavers are grateful for the guidance and expertise of Richard. A long trip downstream was planned. On May 13, 2017, Phillip, Mihai, and Erin lead a troop of 30+ boy scouts and troop leaders from the Belleville area through Mystery Cave. For many of these scouts, this was their first adventure underground. The troop was divided into 3 groups and taken on approximately 1.5 hour tours each. The first wave of students entered the cave around 10:30am. Most of the boys enjoyed the climb down at the gated entrance. The boys were very excited and impressed by the formations, break down pile, and Fossil Passage. In addition to frogs and salamanders, the boys found an unexpected juvenile rattle snake. The troop fearlessly trekked through the cave and hope to tour again. Everyone was able to climb back out of the cave with little assistance. The trip was a success. Phillip later made patches for each of the scouts to add to their patch collection. Mihai arrived at Park Et at 9:10 AM and had breakfast with Richard, who then drove both to Berome Moore. Jim was getting ready to lead a trip inside and told them that LEG was welcome to organize a trip into Berome after contacting him and MCKC. 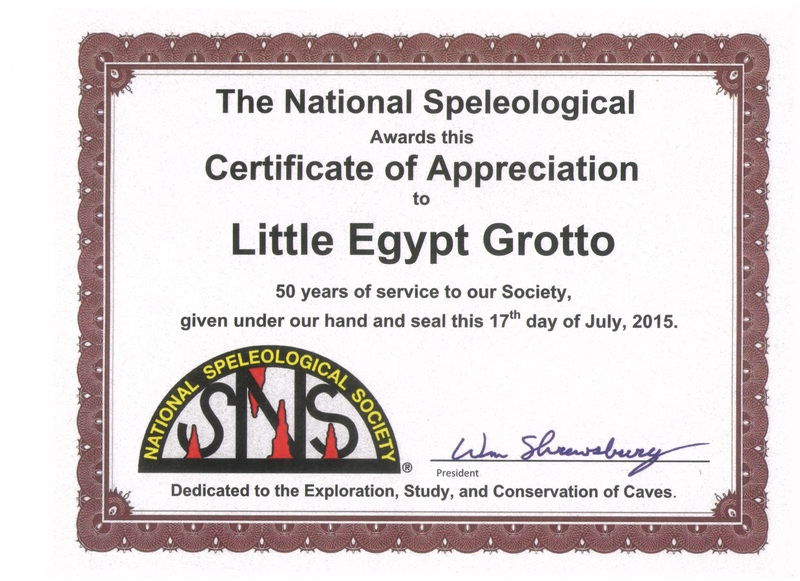 Jim also encouraged LEG to start a scientific study of the cave following the proposal Mihai wrote three years ago. Richard then drove back to Park Et to meet with Ciara and Ryan, hopefully two new LEG members. All arrived at Mystery at around 11:00 AM and entered it through the gated entrance after making sure that Ryan’s helmet and headlamp were OK. It took the effort and imagination of all four cavers to figure out how to attach the suspension to a hard hat! Once in the Cathedral Room it was decided to first visit some upper passages close to the entrance and then go down and follow the main stream for a while. The team admired the passage morphologies and young stalagmites along the Red Fork and Richard and Mihai offered explanations on how the features were formed. The Fossil Passage was visited next and horse teeth were found together with one healthy looking bat! On the way back to the Cathedral Room thanks were said to all previous cavers who had dug steps into clay slopes. Ciara and Ryan were impressed by the clear pool at the bottom of the room. A thermocline was detected while climbing down to the main stream: It was really cold below! The stream was followed up to confluence with the newcomers wet “baptism” passage. Ciara and Ryan followed it to the room with the pouring flowstone while Richard and Mihai climbed to the same room. The multitude of potholes throughout the visited portions was amazing and the former cave floors were clearly marked on the walls by different levels of clay-embedded rock fragments. The cave was exited at about 4:50 PM through the same entrance without any problem. The rock climbing experience of Ciara and Ryan was evident all the time. Mihai and Richard went to Park Et for dinner and relished the day’s trip. The cavers are grateful for Richard’s expert guidance and patience. 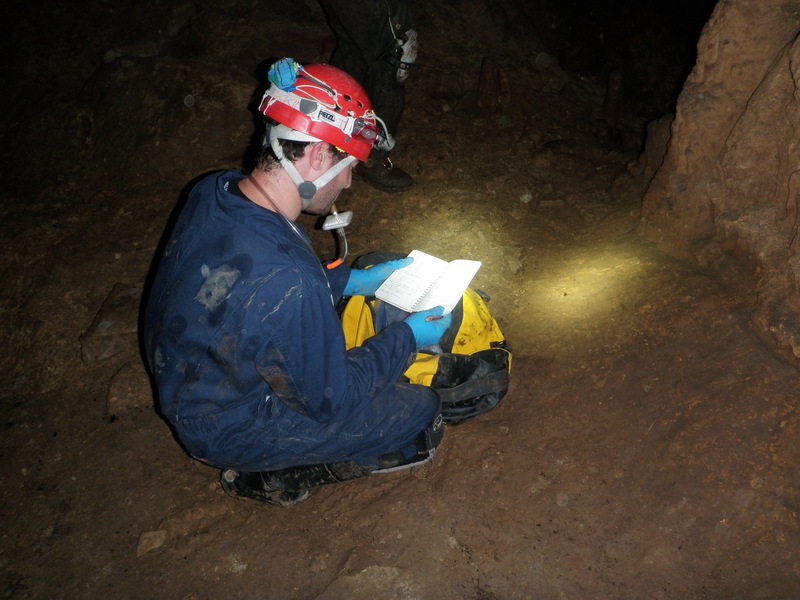 The purpose of the trip was to measure the concentrations of CO2, CH4, and Rn in cave air and introduce Jackie to caving. The weather on Saturday was gorgeous! I was able to give a ride to Jackie and we arrived at Park Et at 11:00 AM where we met with Kevin from Indiana University Bloomington. We then drove immediately to Mystery. 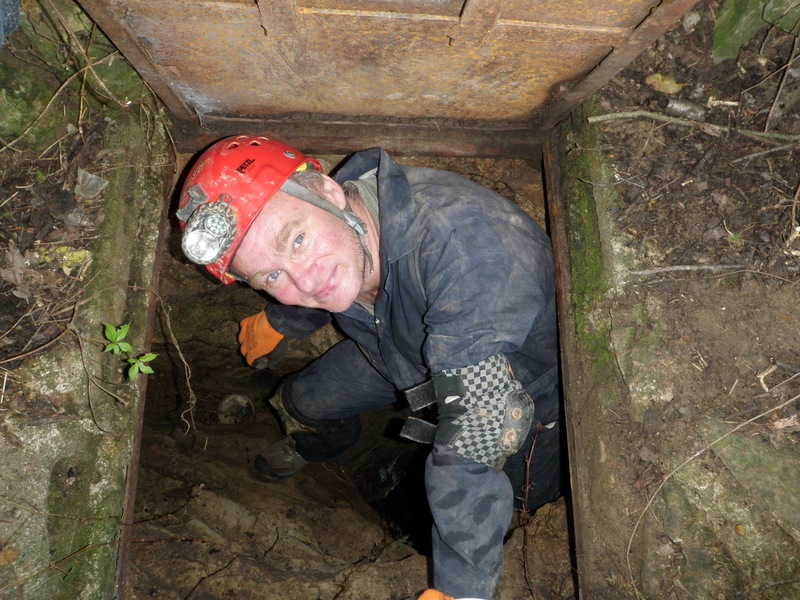 There was no problem opening the gate but it would have been very difficult lowering the gas monitoring equipment through the narrow pit so I decided to enter the cave through the historic entrance. We dragged the frame with the gas monitors over the rubble at the entrance. Kevin put the 40 pound backpack frame with the monitors on his back and we went downstream while measuring the concentrations of CO2, CH4, and Rn in cave air along the way. The sampling points were located at old survey stations. We then took measurements along the passage with the water-gushing flowstone (where we initiate the beginners in wet crawling) and stopped after about 400 ft at a crawl through boulders. We came back to the main stream and went back toward the entrance. Just before reaching the area with the collapsed rocks that reach all the way to the pit entrance we climbed into the passage that starts with beautiful flowstone formations and measured the gas concentrations for about 200 ft. We went back and climbed the boulder slope to the room below the pit entrance. We then followed the northern passage, which was the same we visited in August, for about 1000 ft. Along the way we admired the beautiful rimstone pools and snow white young stalagmites and gave silent thanks to our fellow cavers who left good footholds in the clay slopes. On our way out we made a short detour to the side active passage closest to the entrance and with deep potholes. We were out of the cave at 5:30 pm. It was a very productive trip and both Jackie and Kevin were amazed by the cave. It was a first for Jackie and she did very well. At Approximately 11:00 am cavers Beth (Nebraska), Josiah (Nebraska), Micah (Nebraska), Ryo (Nebraska/Japan), Aron (Univesity of Illinois), Mihai (LEG), Erin (LEG), and Phillip (LEG) entered Mystery Cave via the gated entrance. Since the Nebraska crew was made up of new cavers, in the Cathedral room, we had a brief talk about safety rules in caving to both preserve the cave and ourselves. These cavers were excited and eager to get our trip underway. Aron was with us for a different reason all together. He is gathering specimen from different caves on both sides of the Mississippi River to compare their genetics and so on and so on. 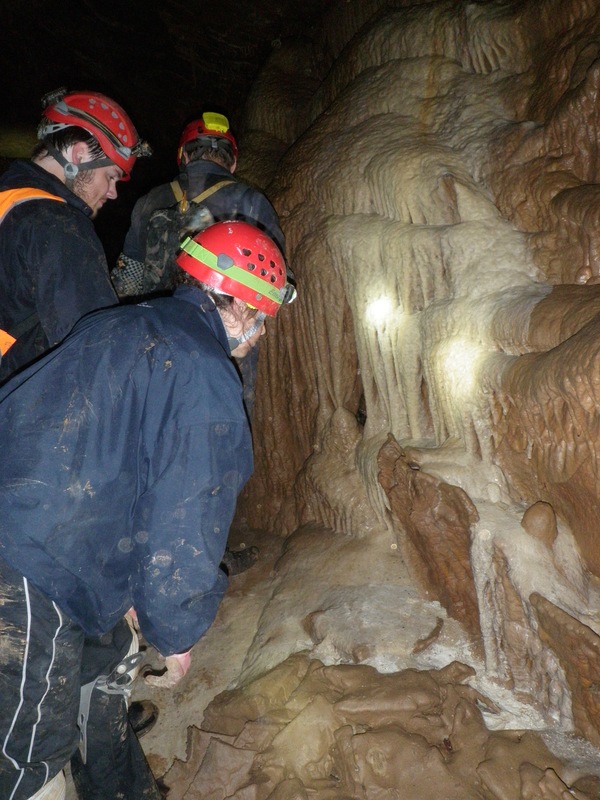 This was a perfect trip for invertebrate sampling and new cavers as both will be moving through the cave rather slowly. The trip began with pictures at the Sentinel. All were greatly impressed with the coloration of this formation. As the crew slowly developed cave legs we made our way towards the Liberty Bell. Again everyone was greatly impressed with this formation and Aron was able to take many samples of the cave invertebrates he was looking for (the largest concentration of these invertebrates he had ever seen in one spot). We continued down Liberty Bell Passage until we reached the breakdown pile where our only option was to turn around. From here we made our way to Red Fork Passage. In Red Fork Passage there were discoveries of teeth and other bones which fascinated Josiah. For the most part this section of the cave was just easy going caving. 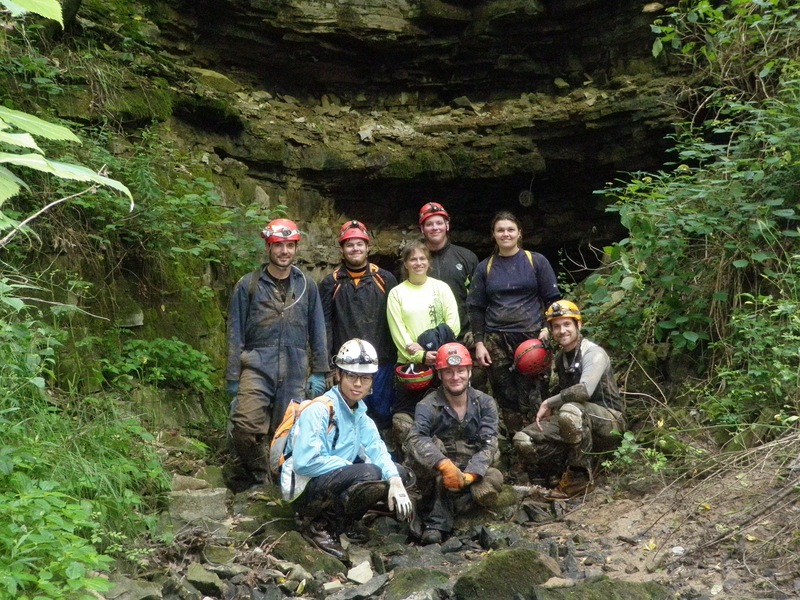 Erin and Mihai took our new cavers to see the Iron “Blood” Formation while Phillip took Aron down the Fossil Passage. Aron’s day was made when fresh raccoon poop was found in this passage just as they were about to turn around. Aron found this habitat to have everything he was looking for. This score alone made his trip a complete success. Everyone met for lunch around 2:30 at the convergence of Red Fork and Liberty Bell Passages. Together we shared good food and laughs. Once our bellies were full we continued our journey, making our way to the Stage Curtain Room. Everyone was extremely impressed by this formation. 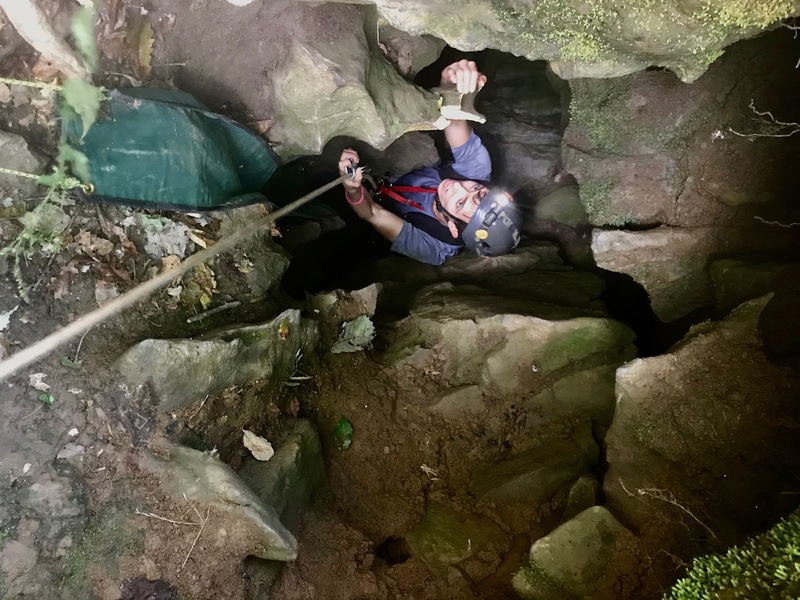 While the group admired this section, Aron picked up his last inner cave debris sample slightly further down the passage towards the Lily Pad Room. Upon completion the group came together for a photo near the Curtain (which came out very blurry). This concluded the plans for the day and we began our exit through the Mystery Cave Main Entrance. Everyone exited safely while Aron collected his last sample of the trip, sampling from just inside the entrance. This trip concluded with many smiling faces captured in our group photo just outside the main entrance. This was truly an enjoyable and successful day for all! Thank you for 50 years of service! Posted on October 9, 2015 by Erin Thomas | Comments Off on Thank you for 50 years of service! Comments Off on Thank you for 50 years of service!